We are a clothing brand started from the year of 2016. We have a design team with factory and warehouse offline. We devoted ourselves to M&Z, waht we do is all want every people browse in our store has a happy shopping experience and choose really useful products. Shopping is fun,choosing beautiful products to decorate our life and hearts. Because our socks contain 80% cotton fiber,the washing shrinkage won't be avoid, we suggest cold water wash, and we have tested many times of washing them, they will stretch back out as soon as you wear them again. * If you have issues about orders, please feel free to contact us before you leave review or feedback , we will try our best to solve any issues about our products and we promise we will take responsibility to the items which only sold from M&Z Global Direct US Online. * Thanks for your understanding! Wishing you a happy shopping! 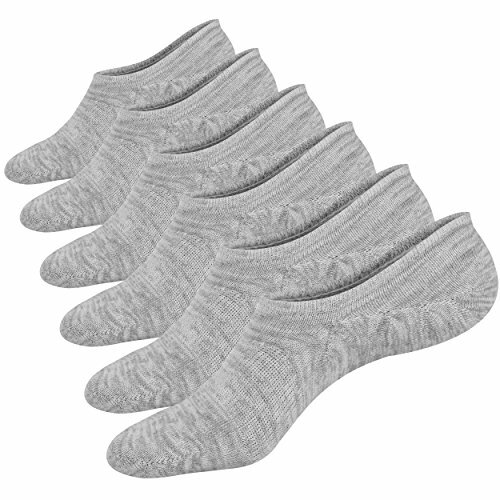 POINTS: No Show Low Cut Socks,small package easy to carry when travel or go out. Moisture Wicking.Machine wash warm,tumble dry mudium. SIZE: US Shoe Size 6-11. Machine wash,tumble dry mudium,only non-chlorine bleach when needed,do not iron. FEATURES: Don't Slip ,3 Silicone Strips at Heel. Don't slide off.The top of the sock comes up high enough to cushion the "tongue" of the shoe. The back grip keeps the sock in place & it doesn't end up under your foot.DESIGN: Classic color grey, matchable for all of your shoes,low cut design, resolve the embarrassing. ATTENTION PLEASE: ALL OUR PRODUCST ARE SOLD ONLY BY Mottee&Zconia US Online Store, WE DO NOT AUTHORIZE ANY OTHER SELLERS TO SELL OUR MOTTEE&ZCONIA BRAND PRODUCTS UNDER OUR LISTINGS ON AMAZON. IN ORDER TO OFFER ALL THE CUSTOMER'S A PLEASANT SHOPPING EXPERIENCE, WE REMIND ALL THE CUSTOMERS DO NOT TRUST ANY COUNTERFEITE SELLERS. WE WILL TAKE RESPONSIBILITY TO ALL OUR CUSTOMERS PURCHSED FROM Mottee&Zconia US Online Store ON AMAZON. THANK YOU FOR YOUR SUPPORT. If you have any questions about this product by Mottee&Zconia, contact us by completing and submitting the form below. If you are looking for a specif part number, please include it with your message.